Aronia The Aronia is a small berry, also known as chokeberry, reminiscent of their shape on her blueberries. Aronia Trees originally from America, but have long been at home in Europe. In Russia and Eastern Europe, the aronia berry has been used for decades as a medicinal plant. Only in recent years the healing power of aronia berry has also been recognized in Central Europe. Since it is often used in cardiovascular disease and inflammation of all kinds. The use of aronia is very diverse and is similar to the application of other berries. Aronia can use as a juice, puree, jam, as well as tea. The market there are aronia berries as fruit bars, fruit balls or capsules. For a chokeberry tea poured over one to two teaspoons of dried Aronia berries with a cup of boiling water and lets him go 15 minutes. Then strain and drink in small sips. From this tea you drink a day to three cups. As with all potent medicinal herbs you should take a break after six weeks of continuous use and temporarily drink another tea of ​​similar effect. Then you can drink for six weeks chokeberry tea again. By break any adverse long-term effects are prevented and the desired Aronia-effectiveness is maintained and not be by getting used to. A particularly intensive use of aronia is drinking the aronia juice. In Aronia juice, the active ingredients of the aronia berry contains high concentrations. The aronia juice tastes sour-tart. Every day you should drink 50 ml to 100 ml Aronia juice. The effect only becomes apparent after a while (at least a week). Attention! The aronia juice has a strong coloring effect. The strong natural dye which is contained in the aronia berry, is the decisive, healing drug and therefore desirable from a health standpoint. However, one should not mess unnecessary because stains are difficult to be removed with the juice. Even tongue and teeth can be temporarily discolored from Aronia juice. To prevent this discoloration, you can drink the juice through a straw. The aronia juice can be a cure drink with all types of cardiovascular disease and circulatory disorders. It helps agains hypertension, but also against low blood pressure, because of regulates blood pressure. The blood circulation is improved and the risk for heart attack or stroke is reduced. Moreover Aroniasaft (or tea) helps against the unpleasant consequences of chemotherapy. By the juice chemotherapy is better cope with and you feel healthier than without him. Due to its immune-stimulating effect can be prevented with Aroniasaft colds. An excessive end immune system is, however, reassured so Aroniasaft can help such as rheumatism and allergies and autoimmune diseases. If you own chokeberry trees in the garden, can also be prepared in the aronia juice itself. To this are added the freshly harvested, mature aronia possible in a pot and pour a small amount of added water. Then bringing the berries and water to a boil. It should simmer for about 20 minutes. Subsequently, berries and water in a clean cloth, which hangs over a bowl. The cloth to tie together the top and puts it so that the aronia juice drips into the bowl below. One can together amount bund end cloth on the ceiling or, placed over the bowl, stool tie and let the juice drip overnight. In the refrigerator the juice keeps for several days. When boiled down it, you can make it tough for several months. The pulp, so the rest which remains in towel can spread in the oven to dry gently (50-70 ° C). Dried can it cook chokeberry tea. Easy juicing comes with a juice-pan. Originally the Aronia from North America. There she was enjoyed by the natives as a fruit, especially as winter supplies. In 1900 the Aronia was introduced and grown to Russia. Only in the 20th century, was officially designated as Aronia fruit and was then grown gradually throughout Eastern Europe. From there, the Aronia finally came to Germany, first in the East. In the eastern states, especially Saxony, it is now increasingly grown as a healthy fruit and marketed. The healing powers of Aronia have been discovered in Russia about 50 years ago, where the aronia berry is used as a medicinal plant also been around for decades. Only in recent years the chokeberry is recognized and used in Central Europe as a medicinal plant. Aronia is akin to the apple tree, but the fruits are much smaller. 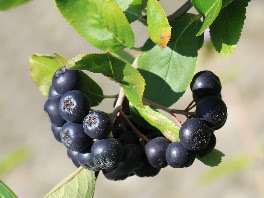 The Aronia is originally native to North America. From there they came first to Russia and from there eventually to Eastern Europe to Germany. From the second year of chokeberry shrub bears fruit and can be harvested. He lives about 20 years or longer. 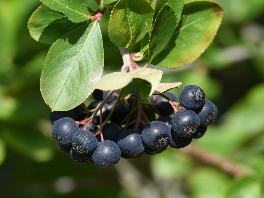 The Aronia bush has gray brown stems with relatively smooth bark. In winter you can already see the burgundy bud tips. The elliptical leaves with fine notching sprout in spring and lush green throughout the summer. In the fall they turn bright red. The small white flowers appear from May to July. They are similar to all of the great flowers of the rose family. But in size they remember especially the flowers of hawthorn or blackthorn. The flowers develop until August or October, the small blue-black fruit. These fruits not only look similar like blueberries, they also taste like when they are once fully ripe. Possibility of confusion exists among others of Amelanchier. The Amelanchier is a small tree that bears blueberry-like fruits. These fruits are ripe but even in mid-summer and form looser than the grape berries of Aronia shrub. In well-stocked nurseries and in some specialized mail order companies can get young chokeberry shrubs. The up to 2 meter high small chokeberry bush is very robust and also thrives in harsh climates. Also to pests and fungal diseases, the Aronia bush can often successfully defend. Aronia is rather undemanding in terms of the ground. For sandy or loamy to but the soil should not be. Sunny location on the chokeberry bush should be, so that the fruit can ripen well. The best planting one young chokeberry shrub in autumn in the garden. It then takes about two years before you can harvest the first fruits. Between August and October, you can collect the aronia berries, if one has its own chokeberry shrubs. The berries are picked and the stems removed. Depending on what you want to do with the berries, they can be dry, processed into juice or puree. Drying takes place gently in the oven so that the juicy fruits are dry fast enough. Unprocessed can you keep the Aroniabeeren anything for two weeks.